4 April: Trump announces he wants all remaining US forces out of Syria “very quickly”. Trump says; “Saudi Arabia is very interested in our decision. And I said, Well, you know, you want us to stay? Maybe you’re going to have to pay”. 8 April: First reports emerge of chemical gas attack in Douma, the last rebel-held town in Syria’s Eastern Ghouta province. Reports are unverified. 8 April: Russian government calls reports of alleged gas attack in Douma “fake news” and describes the story as a “false flag” operation. Russia’s Foreign Ministry states; “The goal of this… baseless speculation is to shield the terrorists and… the radical opposition that refuse to engage in a political settlement [process], as well as to justify potential military strikes from the outside”. 9 April: Trump promises major decision in next twentyfour hours on alleged gas attack. 10 April: Syria and Russia invite Organisation for the Prohibition of Chemical Weapons (OPCW) to investigate allegations of chemical attack in Douma. 11 April: Saudi Arabia’s Crown Prince Mohammed bin Salman says it will support any military strike on Syria in retaliation for the alleged gas attack in Douma; “If our alliance with our partners requires it, we will be present”. 12 April: OPCW (Organization for the Prohibition of Chemical Weapons) fact-finding team lands in Syria to investigate alleged gas attack in Douma. Syria’s ambassador to the United Nations, Bashar Jaafari, said; “We will facilitate the arrival of the team to anywhere they want, in Douma, to check whether or not there was use of chemical substances”. 14 April: Trump announces US-led attack on Syria, launching 105 missiles at targets in that country. Trump states: “So today, the nations of Britain, France, and the United States of America have marshaled their righteous power against barbarism and brutality”. * International time-zones not taken into account: above dates are approximate. Most, if not all stories published on the Herald’s website originate from Associated Press. A Syrian rebel group has accused government forces of dropping a barrel bomb containing poisonous chemicals on civilians in Eastern Ghouta, and a medical relief organisation said 35 people had been killed in chemical attacks on the area. Syrian state media denied government forces had launched any chemical attack as soon as the reports began circulating and said rebels in the Eastern Ghouta town of Douma were in a state of collapse and spreading false news. The third paragraph referred to “an alleged chemical weapons attack in Douma“. The Syrian Observatory for Human Rights said 11 people had died in Douma as a result of suffocation caused by the smoke from conventional weapons being dropped by the government. It said a total of 70 people suffered breathing difficulties. Could it be that the Syrian Observatory for Human Rights inadvertently told the truth before a new version was framed, blaming the incident on so-called “poison gas”, instead of a lack of air and heavy dust? Rami Abdulrahman, the Observatory director, said he could not confirm if chemical weapons had been used. In the same article, the so-called Medical relief organisation, Syrian American Medical Society (SAMS), put the blame on an alleged “chlorine bomb”. They stated it “hit Douma hospital, killing six people, and a second attack with “mixed agents” including nerve agents had hit a nearby building“. It is unclear at this stage how SAMS knew within a day that Douma had been hit by an alleged “chlorine bomb”. The 8 April Herald/AP story continued with reporting of the battle for rebel-held Douma, and that Syrian government forces were advancing on the town. There was no further mentioned of a so-called chemical weapon being used. The following day, the Herald ran another AP story. This time, there was no reference to the term ‘alleged’. Instead, ‘suspected’ entered the framing of the narrative, being used three times. The missile attack followed a suspected poison gas attack Saturday on the last remaining foothold for the Syrian opposition in the eastern suburbs of Damascus. At least 40 people were killed, including families found in their homes and shelters, opposition activists and local rescuers said. They did not identify the substance used, but the civil defense organization, also known as the White Helmets, and the Syrian American Medical Society, a medical relief organization, said survivors treated at clinics smelled strongly of chlorine. Those reports could not be independently verified because of a government blockade around the town. First responders entering apartments in Douma late Saturday said they found bodies collapsed on floors, some foaming at the mouth. By omitting the term ‘alleged’, the above phrase takes on a factual status that is not deserved. There was simply no independent corroboration of any bodies “ collapsed on floors“, nor that “some [were] foaming at the mouth“. What is the point of a not-independently-verified disclaimer if unsubstantiated claims are presented as facts? With the heavy bombardment on Douma, the above statement makes far more sense as to a cause of fatalities. It also ties in with Robert Fisk’s findings. The U.N. Security Council has rejected a Russian resolution that would have welcomed an investigation by the Organization for the Prohibition of Chemical Weapons into a suspected poison gas attack in the suburbs of Syria’s capital. The international chemical weapons watchdog says it will send a fact finding mission to the Syrian town where an alleged chemical weapons attack occurred over the weekend. British Ambassador Karen Pierce said the U.K. opposed the resolution because an OPCW investigative team is already headed to Syria and the Russian text did not include a new body to determine accountability for chemical weapons attacks. Syrian opposition activists say 40 people [allegedly*] died in Saturday night’s poison gas attack in the town of Douma, the last remaining rebel bastion near Damascus. Syrian opposition activists say 40 people [allegedly*] died in Saturday night’s [unverified*] poison gas attack in the town of Douma, the last remaining rebel bastion near Damascus. Syrian opposition activists say 40 people [allegedly*] died in Saturday night’s chemical attack in the town of Douma, the last remaining rebel bastion near Damascus. The opposition blamed President Bashar Assad’s forces for the [alleged*] attack, accusations the government strongly denies. The international chemical weapons watchdog said Tuesday it was sending a fact-finding mission to the Syrian town where a suspected chemical gas attack took place over the weekend, following a request from the Syrian government and its Russian backers that appeared to be aimed at averting punitive Western military action. Russia’s doubts that an alleged chemical attack even took place at all was canvassed, as was the OPCW mission to Syria. Syrian opposition activists and paramedics said more than 40 people were killed in last weekend’s suspected chemical attack and blamed the government. Nowhere was it stated explicitly that reports of any deaths were unverified. Such an omission might lead a reader to unconscious bias, accepting the alleged chemical attack as a proven event because of the claim – still unverified – that people had died. A 13 April Herald/AP story reported that Syrian government forces had retaken Douma from rebels. The so-called “gas attack” was described as ‘alleged’ seven times. 1. What did the Syrian government hope to gain by allegedly using chemical weapons to retake Douma – when it was already close to victory anyway? 2. Why was the alleged gas attack carried out against civilians, rather than rebel fighters? If the alleged gas attack was indeed orchestrated by the Syrian regime, it would have made more strategic sense to target armed enemy combatants rather than unarmed civilians. 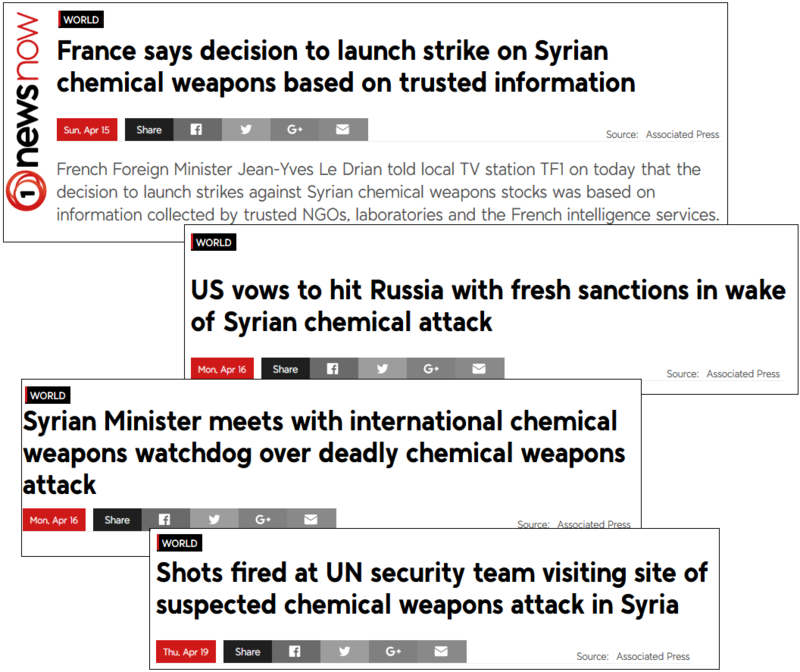 A subsequent NZ Herald/AP story on 13 April carried the claim that the French government had “proof that the Syrian government launched chlorine gas attacks”. The story did not mention what that “proof” was, or how it had been obtained. The OPCW mission to Syria had not yet reached Douma to carry out their investigation. He [President Emmanuel Macron] previously said any French action would target Syria’s chemical weapons abilities. Note: not, “Syria’s *alleged* chemical weapons abilities“. The US-led strike on Syria was only a day away. Media stories now seemed to lean further toward the alleged gas attack as factually proven, rather than still-to-be-verified. The French services analyzed the testimonies, photos and videos that spontaneously appeared on specialized websites, in the press and on social media in the hours and days following the attack. Testimonies obtained by the French services were also analyzed. After examining the videos and images of victims published online, they were able to conclude with a high degree of confidence that the vast majority are recent and not fabricated. The spontaneous circulation of these images across all social networks confirms that they were not video montages or recycled images. Lastly, some of the entities that published this information are generally considered reliable. In other words, Macron – and later Prime Minister Ardern – based their “evidence” on unverified video footage and photographs supplied by rebel groups in Douma. Macron’s “evidence” brings back memories of strident insistence by the US in 2003 that Iraq possessed weapons of mass destruction. Those claims were eventually proven false. The West’s assessments of what happened April 7 in Douma rely mainly on open source information. That includes witness testimony, as well as video and photos shot by aid workers, victims of the attacks and unspecified additional intelligence about barrel bombs and chlorine canisters found in the aftermath. The three countries launched their missiles even as the fact-finding team from the Organization for the Prohibition of Chemical Weapons was in the Syrian capital and had been expected to head on Saturday to Douma. It would be a very astute, politically aware, member of the public to “read between the lines” and arrive at any other conclusion that – on the balance of probabilities”, and not “beyond reasonable doubt” – that the West had reliable evidence to point to Assad’s forces being the culprits in the alleged gas attack on Douma. C. And that an OPCW team was presently in Syria awaiting an opportunity to enter Douma to conduct their investigation. It is against a back-drop of media stories that fail to reinforce that the so-called “gas attack” has not been verified, nor has the OPCW not carried out their investigation – yet statements by Western governments and Syrian rebels are reported as “facts – that a subtle narrative has taken hold in the public’s collective consciousness. Syrians living at the site of a suspected chemical weapons attack say it never happened, according to a new report. British journalist Robert Fisk, writing in The Independent, says when he visited the site in Douma his questions about the attack were met with “genuine perplexity”. The attack was used as a pretext for last weekend’s air strikes against the Russia-backed Assad regime. “Oddly, after chatting to more than 20 people, I couldn’t find one who showed the slightest interest in Douma’s role in bringing about the Western air attacks,” Mr Fisk wrote. The video of civilians suffering from the effects of chemical weapons – believed to be chlorine and sarin – is undoubtedly real, but a local doctor told Mr Fisk they were suffering from hypoxia – oxygen loss – and dust inhalation. The confusion began when someone shouted “gas!” and panic broke out. [Prime Minister Ardern]… has taken some criticism for her less-than-enthuiastic take on bagging Russia, rallying behind the United States and cheering on Donald Trump’s missile strikes on Syria. It has been pointed out, with underscores, that she “accepts” rather than “supports” the US bombing of Syria, and that puts her out of step with other leaders gathered in London this week. Oh dear, a national leader who doesn’t relish killing people … how terribly squeamish. On Thursday, Robert Fisk of the Independent reported from Douma, the city where the Syrian chemical attacks that prompted the US retaliation are said to have occurred. Fisk travelled the pummelled city freely — most of the fighters and government minders from Bashar al-Assad’s regime have got out. His report casts serious doubt on whether there actually was a chemical attack. Fisk has lived in and reported from the Middle East for 40 years; he is fluent in the languages and has never been tainted by suggestions of political partiality or propaganda. In short, he is the genuine article — a journalist. The United States has said al-Assad used chemical weapons in Douma, and maybe that is correct. But it should be remembered that for more than 50 years US foreign affairs have featured two constants — putting its troops in other people’s countries and lying. Vietnam, Cambodia, Laos, Grenada, Afghanistan, Iraq … all have been marked by a consistent policy of lying to the American people and the world. So perhaps Ms Ardern has good reason to be cautious. The first reference from TVNZ’s “One News” was on 8 April, with war reporting centered around the Syrian government’s ongoing battle to retake Douma, in Eastern Ghouta, from the rebel group known as “Jaysh al-Islam – The Army of Islam Syria“. Jaysh al-Islam is funded by the Saudi Arabian government and fought against ISIS. CNN and other outlets are reporting a possible chemical attack against civilians has taken place. The word ‘alleged’ is not used anywhere in the story. The source of the story is Associated Press, but no other indication where it originated from. And for some strange reason, TVNZ placed an image of a launching rocket at the bottom of the ‘story’. Though what that image has to do with Douma is unclear, as rebels have claim that the alleged gas attack was dropped by Syrian Government helicopters – not by missile(s). The terms ‘alleged’ and ‘unverified’ are not used in the above ‘story’. There was no mention of ‘alleged’, ‘suspected’, or ‘unverified’: the headline stated the so-called gassing as fact. The White House sharply rejected any suggestion that Trump’s own words about pulling US troops out of Syria had opened the door for the attack, which killed more than 40 people, including children. There was no follow-up on this point. The un-named author does not elaborate on the suggestion that “Trump’s own words about pulling US troops out of Syria had opened the door for the attack“. In what way had “Trump’s own words about pulling US troops out of Syria had opened the door for the attack“? The nature of the impartiality of the terminology may have been prompted by the re-taking of Douma by Syrian government forces, and serious doubts being raised regarding the veracity of the so-called “gas attack”. Or, the author of this particular write-up may have been more conscious of the fact that the so-called “gas attacks” were, as yet, unverified. The phrase should have read “… and *allegedly* killed more than 40 people in Douma…”, to keep it consistent with the unverified nature of this story. The story reported that OPCW was sending a team to investigate the situation in Douma. It also featured strong counter-claims from Syria’s Russian ally. The Russian Ministry of Defence on Friday (local time) said it has enough evidence showing that a planned provocation was carried out in the case of alleged chemical attack in Syrian town of Douma on April 7. The headline and the body of the text are contradictory. It would be interesting if there were a follow-up to this story to determine if – after the buildings were destroyed by missiles – the surrounding area had been contaminated by toxic chemical fall-out. – did not pre-judge the veracity of the rebel’s gas attack claims. President Donald Trump on Saturday declared “Mission Accomplished” for a US-led allied missile attack on Syria’s chemical weapons programme, but the Pentagon said the pummeling of three chemical-related facilities left enough others intact to enable the Assad government to use banned weapons against civilians if it chooses. Despite being a state-owned broadcaster, TVNZ – like its privately-owned cousins – has used language that pre-determined (a) the veracity of the alleged “gas attack and (b) those culpable. Attempts to use neutral, non-judgemental terms have been sporadic and mostly within the text of the stories. The headlines cannot be viewed in any other way than casting blame on the Syrian government as being the ‘authors’ of the so-called gassing of Douma. None of which has yet to be verified by the OPCW acting on behalf of the U.N.
A medical relief organisation has estimated 35 people have died as a result of the attack, while the Syrian Observatory for Human Rights has confirmed 11 deaths. A Syrian rebel group is accusing government forces of launching the attack. State media has denied this claim. More than 70 people suffered breathing difficulties due to the attack, reported the Syrian Observatory for Human Rights. According to the Syrian American Medical Society, a chlorine bomb targeted Douma hospital and a second bomb with “mixed agents”, including nerve agents, was dropped on a nearby building. The most basic journalistic tenet was ignored: question everything. The story could have been written by hired propagandists writing for any government. It was not news – it was a copy-and-pasted press release. 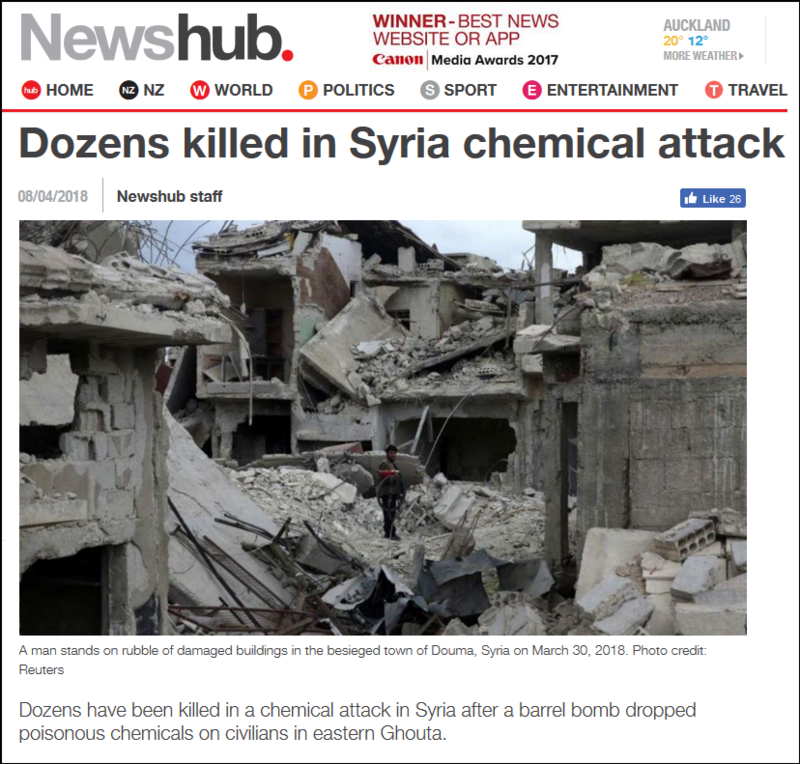 Though the term “a suspected chemical attack” was used and Russian statements denouncing the claim as bogus were published, the headline carries the weight of pre-judged pseudo-authenticity. The headline conveyed the firm message: the “gas attack” happened; people died; an atrocity was committed. The subtext is that the culprit was the Syrian government (or its allies). After all, why would the rebels gas their own? That would be like questioning whether the “gas attack” occurred at all. The United States, France and the UK have launched military strikes in Syria to punish dictator Bashar al-Assad for his suspected chemical attack against civilians and to deter him from doing it again, President Donald Trump has announced. – and then declared that the Western attack was launched to “punish dictator Bashar al-Assad for his suspected chemical attack against civilians and to deter him from doing it again“. “Doing it again“? Is the world completely convinced Assad did it the first time on 7 April? The one-off missile strike in April 2017 targeted the airfield from which the Syrian aircraft had launched their gas attack. But the damage was limited, and a defiant Mr Assad returned to episodic use of chlorine and perhaps other chemicals. There was no corroborating evidence to back up the assertion that “a defiant Mr Assad returned to episodic use of chlorine and perhaps other chemicals“. It was an assertion based purely on Western government’s press releases. The US military says the joint air strikes by the US, UK and France have set back Syria’s chemical weapons capability “for years”. The target, a chemical research centre outside Damascus, was on the receiving end of 76 of 105 cruise missiles fired at Syria on Saturday. – without a shred of evidence that the destroyed buildings housed “a chemical research centre“. For all we know those buildings may have been producing pharmaceuticals, as one Syrian official stated. Or buzzy-bees, for Syrian children. There is zero evidence either way. Jacinda Ardern said on Saturday New Zealand “accepts why” the strikes, which targeted Syrian chemical weapons facilities, took place. “The action was intended to prevent further such atrocities being committed against Syrian civilians. Not even the lesser term ‘suspected’ was used. Unfortunately, the Green’s condemnation of the US-led bombing failed to mention anywhere that the alleged “gas attacks” had yet to be verified by the OPCW. Their statement in Spinoff on 14 April accepted the so-called “gas attack” in Douma as factual. At no point does Mediaworks/Newshub recognise the contradiction of apportioning blame to Assad before the OPCW had had a chance to investigate. Note the phraseology: “Three chemical weapons facilities in Syria” – not “three *alleged* chemical weapons facilities in Syria“. On April 7, civilians in Syria were attacked with chemical weapons. The images that came out of the attack were horrifying – civilians convulsing and struggling for breath, children ash-faced and terrified. At least 42 people were killed. It is the second time Mr Trump has ordered retaliation after the Syrian government used chemical weapons. Russian officials have even suggested the attack was staged. Mr Trump said that attack was also a direct punishment for Assad’s alleged use of chemical weapons. It was a rare moment for Mediaworks/Newshub to employ the term ‘alleged’. At some point, the author may have realised that allegations of a “gas bombing” had yet to be proven. Thus far the story appeared to be firmly in the realm of war propaganda. One would find it inconceivable that the smell of chlorine would go unnoticed by citizens in a sizeable city such as Douma. As far as this blogger can determine, Mediaworks/Newshub was only one of two media outlets that reported on Fisk’s findings in any meaningful way. The other was Mark Dawson, writing an editorial for the Whanganui Chronicle. The attacks came after yet another gas attack that killed 75 people, including children. US airstrikes in Syria last year in response to a chemical weapons attack clearly didn’t deter further similar attacks by the Syrian regime. But meanwhile the Syrian war wages on. Children keep dying, being gassed, poisoned by nerve agents – eyes weeping, noses and mouths streaming and frothing. They’re vomiting, and if the exposure is great enough they’re lucky if they die fast. Nowhere does she mention that not only is the alleged “gas attack” unverified – but that the OPCW has despatched an investigatory team to search for evidence. The stuff we usually require before confirming a crime took place and assigning guilt to the culprit. Luckily for us there are real journalists operating who ask the hard questions and risk their well-being to bring us the truth. It is far harder than Ms O’Brien and her desk-bound colleagues who operate well away from “theatres of conflict” and instead rely on propaganda from governmental media “advisories” (ie; propaganda). 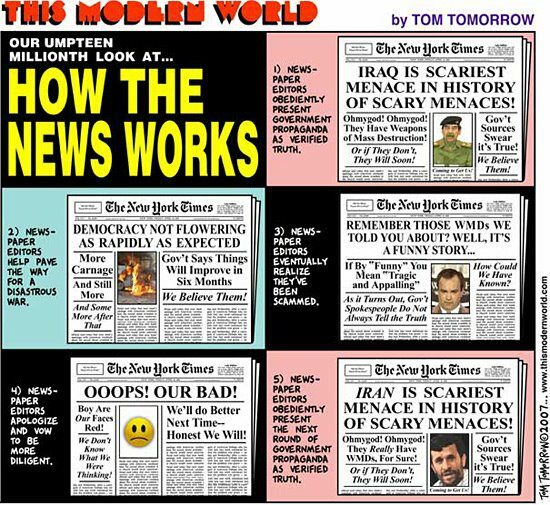 Unfortunately, when the truth is eventually teased out and presented to the world (as when the mythical “weapons of mass destruction” were shown to be a Western governmental fabrication), it is rarely presented with the same mass-coverage as the original “fake news”. In this case, Robert Fisk went to Douma and discovered that the so-called “gas attack” lacked credibility with the locals. In other words, he revealed that it was fake news. The question we – especially so-called professionals in the mainstream media – should be asking is: did the public notice? What makes governmental war pronouncements sound so credible is not from whence they emanate – but that they are given a veneer of factualness by constant, non-critical repetition by the mainstream media. Our media is tasked with running a critical gaze over government-supplied information. Alleged “events” are supposed to be tested and “facts” fact-checked. Instead, when it comes to war, in many instances they have become a compliant mouthpiece for State propaganda far more effective than anything Josef Goebbels could have envisioned in his widest dreams. No wonder George Orwell’s “Ministry of Truth” was never built. Instead it was outsourced to private enterprise. They apparently do it so much better. Your fellow citizens need YOU! Its hard to realize how partisan our media is until its pointed out with a careful analysis. The scary thing is that the MSM could lead the West to war by not questioning and holding to account government propaganda. 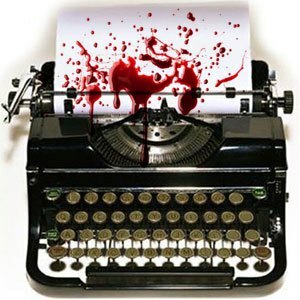 Investigative Journalism is a dead art form in MSM, has it actually been banned by law ? John Key definitely wanted Investigative Journalism banned in NZ ? Did his best by removing John Campbell and definitely interferred with a few other peoples future careers ? If this is so I am surprised the author does not make the obvious connection that this policeman “minder” who was the first to visit Skripal’s home, would almost certainly have been the person who planted the Novachok or whatever on the door and around the interior of the house. I still harbour the maybe foolish notion that there is a fellowship among scientists, making them resistant to politicisation . If she’d written in her own language, Russian , I think her family would have been able to detect her current state of mind, and also whether the words were truly characteristic of Yulia. The statement was for a British audience, not for Yulia’s nearest and dearest. I’m slightly worried at the potential bias of the Dutch lab who are tasked with testing/distributing the OPCW samples, given that The Netherlands despises Russia (primarily due to Malaysia Airlines Flight 17 shot down over the Ukraine that killed ~200 Dutch people) and is a close ally of the US, France and UK. Is the OPCW a genuinely impartial organisation? Hi Frank, putting aside the alleged gas attacks for a moment, in your honest opinion. Who did this, and is not evidence of genocide? Frank I know that you have greater moral courage than the Assad apologists over at The Standard, who maintain a strict silence, close to complicity, in the face of this atrocity, and other proven regime atrocities. And when pressed, resort to censorship, rather than give an answer. Bill for instance in a breathtaking act of hypocrisy, In a post called, “Heroes”, inserts a quote that equates silence to consent, before slapping a one year ban on me, for daring to ask him to break his own strict silence over the genocide in Homs. And in a larger scheme of things, 27 year old Kimberley Taylor has traveled to Syria to help Syrians fighting against Daesh. Heroes: Jenny, – Who did this? I suspect the “apologists” as you call them, are mostly pointing out the rank hypocrisy of Western countries that invaded Afghanistan, Iraq and Libya, killing at least a million civilians with the same type of bombs (i.e. conventional) that Assad has been using. Frankly, the West’s interventions (and outright invasions) of sovereign nations makes Assad look like a pacifist (especially since he is dealing entirely with domestic “rebels” that want to overthrow his legitimate regime by force, something he is entirely within his right to militarily oppose btw – I’m pretty sure the NZ government wouldn’t react that much differently were the same sort of thing to happen here). Agree %100 Nitrium, and we know Assad is an evil monster because? (cue violins) the investigative and completely unbiased msm told us so!!! No one seems to point out that a government has not just the right but the absolute duty to do what is necessary to protect it’s citizens. If in extreme situations that endangers some to secure the many this is what has to be done, and all governments do it. But probably never has a government had to deal with an externally funded and armed cut-throats like this before. the only comparison would have to be an acknowledged invasion by a another country. It looks like it will soon turn into an overt state(s) on state conflict anyway once the covert conflict is under control. I don’t share any “love” or “admiration” for Assad. My report above should not be confused with any notion of support for the current government of Syria. The legitimacy (or otherwise) of Assad’s government is another issue for another day. My concern is purely for reporting that should be done as factually as possible. Where doubt exists – of which there is plenty – so-called “facts” should be presented with caveats. OK Frank, good, I suppose, as far as it goes. But what are your “caveats” on this? Maybe you would like to try and provide caveats of this atrocity for your readers? There is a reason that I concentrate on this above atrocity. With every single atrocity committed by the Assad regime against the Syrian people, as the evidence pours out, Assad apologists rely on three main levels of obfuscation, which escalate in their grossness, as the evidence accumulates. Second response: It was staged by crisis actors, it was all faked. Third response: It was committed by the “terrorists” on their own people to discredit the regime. ie a false flag attack. There is a reason that people like you, like Bill, ignore the horrific genocide committed in Homs. (you still haven’t answered the question). 2/ You can’t claim that the horrific video evidence of the destruction is staged, or is fake. 3/ You can’t claim that the “terrorists” did it to themselves to discredit the regime. In my opinion Frank, the horrific genocide committed by the regime in Homs cannot be accompanied with your so called “caveats”. (You can try if you like, and I invite you to). In the case of other regime atrocities, like those being committed by the Assad regime in Sednaya and other regime death camps also cannot be confused with the first three methods of obfuscation. As Amnesty International says, we have more evidence for these crimes than we do of the crimes committed in Austwich. For these crimes there is a fourth level, which you and Bill are both guilty of. 4/ Ignore it. Don’t mention it. Forget it. Genocide is being committed right under our noses Frank. those committing this genocide, like the smoking industry, like the climate destroying oil companies, have found they can’t win by open denial. Their job is to merely sow doubt. They do this by throwing up as much smoke and dust as they can, just as you have amply shown with your impressive list of conflicting accounts. Frank nobody can drink from this fire hose, not you, not me. Luckily for me, unlike you and Bill, I have actually been to Syria and seen this regime close up. This why, you, who have never been to Syria, need to simplify things down to just a few basic verifiable facts that no one can confuse obfuscate with firehose tactics. Is the shooting down of peaceful demonstrators accepted by you, should such claims be accompanied by “caveats”? Is the bombing of defenceless civilian population centres from the air accepted by you, should such claims be accompanied by “caveats”? Are regime disappearances and mass detention and execution without trial and torture accepted by you, should such claims be accompanied by “caveats”. And is it not evidence of genocide? Jenny, I’ve read enough of Frank’s blogposts and his comments to understand his sense of fairness on this, and many other issues. Trying to “box him in” to a certain corrner won’t achieve anything. There is no coverage of the real Syrian tragedy in NZ mainstream. At all. Douma is a HOAX. So was Ghouta and Khan Sheik Houn. Body parts of Syrian children ARE being trafficked. The WhiteHelmets are a con job run by MI6 and The Saudi fascist/USAMO/Israeli/FUKUS terrorists are routinely brutalizing the people of Syria under cover of MSM silence. Thousands murdered by terrorist entities the west are allied to. Mendacity so base; cruelties so deep and hateful, words barely approach them. Yet our news hubs and popular presses manage a total and DELIBERATE failure to address any. [“We have accurate information that over 25,000 surgical operations have been conducted in the refugee camps of the neighboring countries and in the terrorist-controlled areas in Syria since 2011 to take out the body organs of 15,000 Syrians and sell them in the International Black markets.” Dr. Noufel https://www.sott.net/article/334172-Coroner-discloses-body-organs-of-over-15000-Syrians-sold-in-past-6-years-to-fund-ISIS and that was 2016. A week ago we were almost at WAR with Russia. Salisbury was in every news cycle pumping the narrative until it started to blow back. Douma and Skripal were WW3 cassus belli until Inconsistencies turned into factual anomalies into straight out contradiction into sudden and complete ‘radio’ silence. Where doubt exists – of which there is plenty – so-called “facts” should be presented with caveats. You can bring photographs from anyone and say this is torture. There is no verification of any of this evidence, so it’s all allegations without evidence. Human Rights Watch set out to answer three key sets of questions about the photographs of the dead detainees: 1) Are the photographs authentic? Are they really images of dead detainees? 2) If so, what caused so many to die? and 3) How did the bodies end up in military hospitals and what happened to the corpses afterwards?….To verify the photographs, Human Rights Watch conducted in depth investigations into the cases of 27 deaths in detention of people whose bodies appeared in the photographs. The investigations included examination of evidence provided by families of the deceased and fellow detainees. Human Rights Watch also examined photographs of the 27 detainees before their arrest and compared them to the photographs of their dead bodies smuggled out of Syria by Caesar. The search for relatives of dead detainees whose photographs were included in the Caesar images was facilitated by the fact that in March 2015, several thousand photographs of the dead detainees were posted online by the SAFMCD, published in the Syrian electronic news source Zaman al-Wasl, and picked up by various other Facebook groups dedicated to people disappeared, detained, or killed in Syria. Though media outlets around the world had already covered the story of the Caesar photographs in January 2014, and published redacted or blurred versions showing groups of emaciated bodies, the March 2015 publication was the first time families could search for their relatives among the photographs. Many relatives of detainees, as well as activists and friends, spent days going through the photographs looking for missing relatives. Some of them contacted the SAFMCD directly, and after providing evidence that they were family members of the deceased, received the full set of photographs depicting their relative. Human Rights Watch was able to verify 27 cases of detainees whose family members’ statements regarding their arrest and physical characteristics matched the photographic evidence. The 27 cases included those of a 14-year-old boy and a woman. Both these cases are described in this report. To help identify the 27 victims, Human Rights Watch researchers asked families for identifying characteristics including birthmarks, scars, and tattoos; noted and compared the dates of arrest and the date linked to the victim’s photograph; and sought out evidence from former detainees who saw the victim in detention. In eight cases, former detainees saw the victims in detention, and in four cases, former detainees witnessed their death or saw their body. In some cases documented in this report, families obtained from the SAFMCD photographs showing their relative’s full body and were thus able to make positive identifications based on their clothing or other distinguishing marks not visible in the photographs available online. Out of the 27 identified cases, eight families consented to the publication of details of their relatives’ stories. These cases are outlined in this report. In total, this report is based on 27interviews with family members of detainees who died in detention facilities, 37 former detainees, and four defectors who worked in Syrian government detention centers or military hospitals in Damascus. Syrian civil society groups identified many more victims, in addition to those cases analyzed by Human Rights Watch. The SAFMCD, the group that initially published the photographs, told Human Rights Watch that more than 700 families got in touch with them saying that they recognized their missing relatives in the photographs of the dead detainees. Only one in ten families were willing to speak about their relative’s death publicly, for fear of reprisals against them or their family members that remained in Syria, according to SAFMCD. Human Rights Watch also sought to verify the photographs through more technical means. While most of the photographs of the detainees lost their metadata when they were copied to be smuggled out of Syria, 271 photographs still had partial metadata indicating the four models of camera the photographs were taken with, as well as some dates. In July 2015, news reports emerged that the U.S. Federal Bureau of Investigations (FBI) analyzed a subset of the Caesar photographs, and found no evidence that they had been manipulated. Finally, Human Rights Watch researchers also authenticated and reviewed a set of images of medical reports, death certificates, identity cards, and military orders included among the collection Caesar smuggled out of Syria. These documents provided further evidence the photographs originated from Syrian military hospitals, and that they were taken following written orders from Syria’s military judicial authority. Military orders confirmed that security branches transferred bodies to the military hospitals for registration and burial. Any “caveats” you would like to add Frank? Interesting you have spent time in Syria Jenny, I have not. When were you there? Recently? or before the revolution? There seems no doubt that they have had a repressive prison system operating there, Whether Bashar al Assad is responsible for it’s creation and all the injustices that have occurred within that system is not so clear to me. My impression is that he set out to reform Syria and govern it for the best interests of most Syrian people, maintaining the sectarian co-habitation of a complex mixture of peoples and religions that had been getting on together better than most places in the Middle east. It seems like most Syrians want him to continue in that role. Only an open and free election will determine this. Let us all hope that this can happen one day. In the meantime, who do you see as replacing him to end the strife? Do you believe there is someone person or organisation other than ISIS or al Qaeda that would replace him if he stepped down? Do you think that the Syrian people should be allowed to decide if they want him or not? Or do you think he should be removed by the US and that Trump or Pompeo should decide who is the President of Syria?